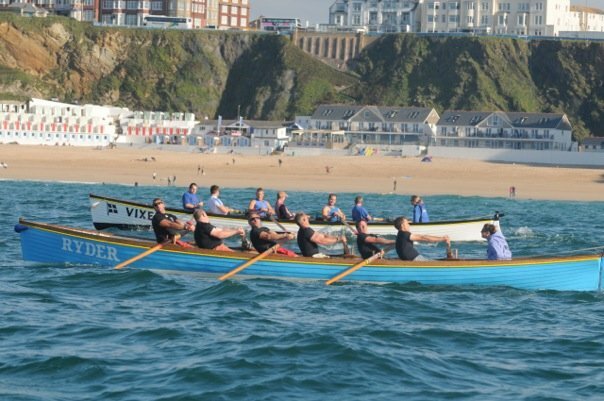 Choppy, breezy but consistent conditions greeted the 3 F&MPGC mens crews this weekend at the county championships hosted by Newquay Rowing Club. In the round 1 opening heats, Mens A (Paddy, Steve, Al, Andy, Neil, Jeremy) raced in heat 6. Mens B (Tommy, Vince, Russ, Tim, Danny, Jowan) were up in heat 16 and Mens C (Ian, Trevor, Ron, Sean, Paul, Mark) in heat 9. Mens A won their heat comfortably in 16:05 from a strong Weymouth crew. Mens B 4th in heat with 16:58 and Mens C 6th in their race which was also their first North coast rowing experience (!) with a time of 18:48. There’s a severe cut for progression from round 1 to round 2 with half the fleet being eliminated and Mens B and C didn’t make it through. Mens B missing the cut by just 2 seconds but this lined them up to race again in the plate final later in the day. 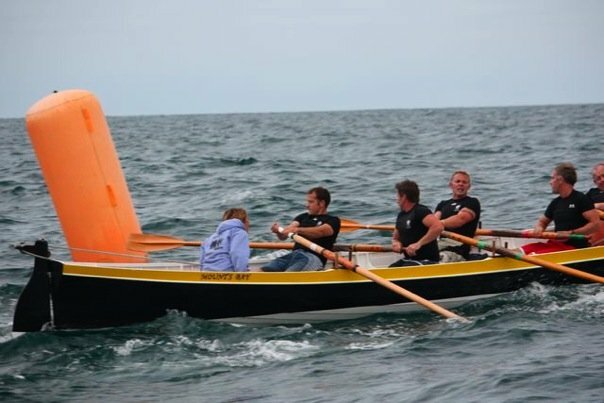 Mens A progressed to round 2 and this time in Ryder held onto the coat tails of the very strong Caradon B crew in Vixen to take second place in the race with a time of 15:46. Mens B were very happy to row again and rounded off the day with an excellent plate race, putting in a much better row with 16:46 on time, beating Zennor B by 1 second – a massive finish to overtake the Zennor crew and 2nd place behind Dart A. Nail biting stuff to watch! (Their plate race time would have put them 32nd on time in round 2). Entering the quarter finals on Sunday morning the heats were getting harder to stay in. Faster and faster times needed just to progress to the next round. Mens A again drew Ryder and crossed the line 4th in 15:17 just behind Cattewater A. Sadly Mens A were disqualified for an incident at the Eastern mark but even without the DQ their time placed them 14th overall with just the top 12 places progressing to the semi finals. The 15:11 of Falmouth B being the cut off point. All in all some great performances in challenging conditions. 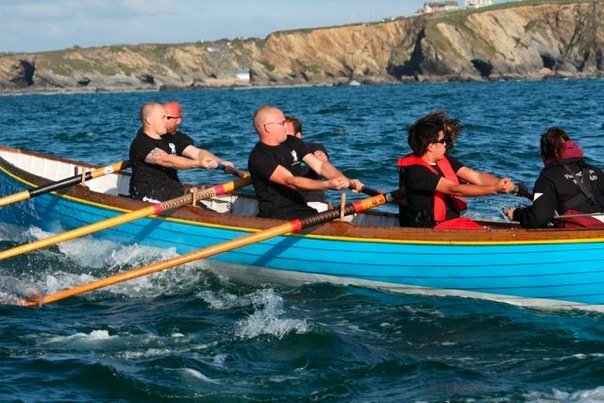 Many thanks to Newquay Rowing Club, the race organisers, helpers and CPGA for all their hard work on making the county championships such a success.